BAYTOWN, Texas – For the first time in NHRA history a father-daughter duo will start No. 1 on Sunday at the 32nd annual Mopar Express Lane NHRA SpringNationals presented by Pennzoil at Houston Raceway. 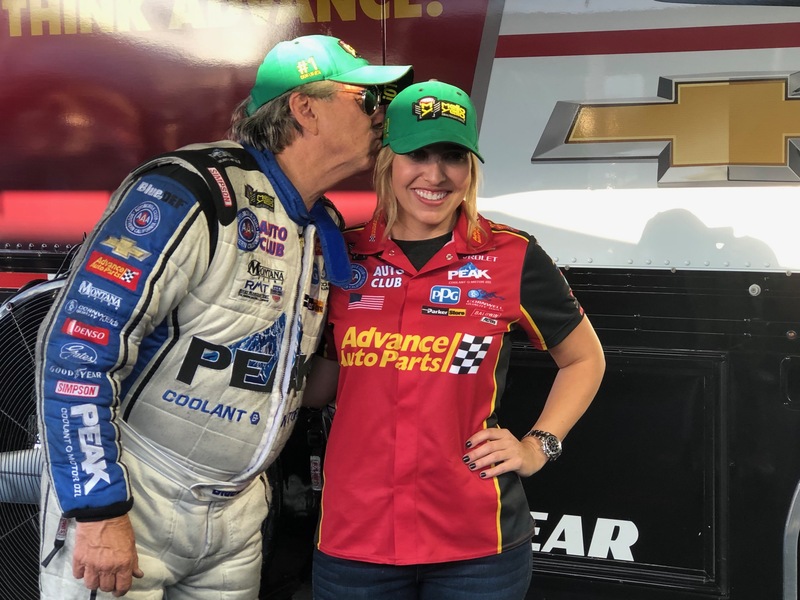 Sixteen-time NHRA Funny Car champion John Force, along with his daughter Brittany Force, winner of the 2017 NHRA Top Fuel championship, both became the first father and child to ever qualify No. 1 together at NHRA Mello Yello Drag Racing Series event. It was J. Force’s 156th career pole while B. Force picked up her 12th No. 1 qualifier. If J. Force wins it will be his 150th career victory. It’s also his 11th No. 1 at Houston Raceway. Force will start No. 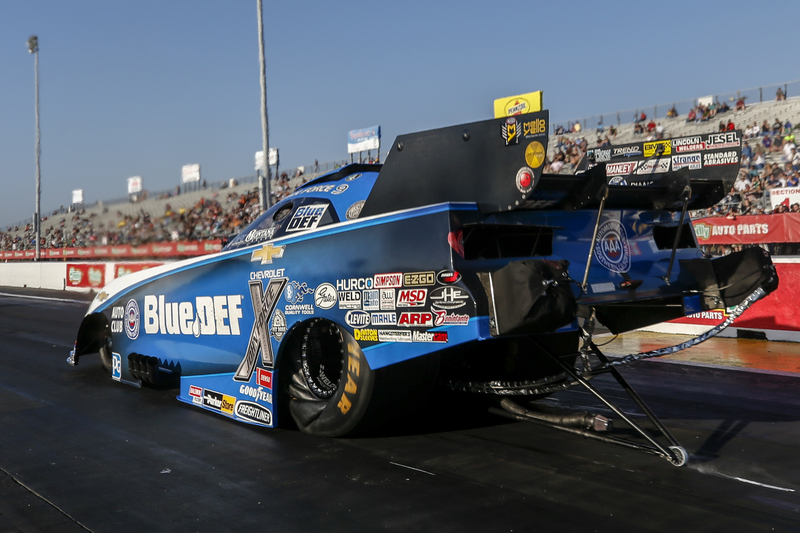 1 in his PEAK Coolant and Motor Oil BlueDEF Nitro Funny Car after recording a 3.888 second run on Friday. He will face Terry Haddock in the opening round. On Friday night, B. Force set both ends of the track record after a blistering 3.661-second pass at 332.18 mph from Friday’s night qualifying session in her Advance Auto Parts Top Fuel dragster. She will face Cameron Ferre in the opening round. Force said she used today’s two qualifying sessions to help prepare for Sunday’s elimination rounds. Both drivers have seen great success at Houston Raceway Park. J. Force secured his 100th win here and Brittany Force had her first victory here in 2018 after a horrific accident at the season opener in Pomona in 2018. “Courtney (Force) and I have been No.1 qualifiers together and I’ve won with Robert (Hight) but dad and I haven’t done anything yet side-by-side,” B. Force said. “So to be No. 1 qualifiers would be great, but I am really looking to win with him this season. Sunday’s weather forecast calls for ideal racing conditions. Low humidity and temperatures around 70 degrees could help produced record runs on the quarter-mile drag strip. 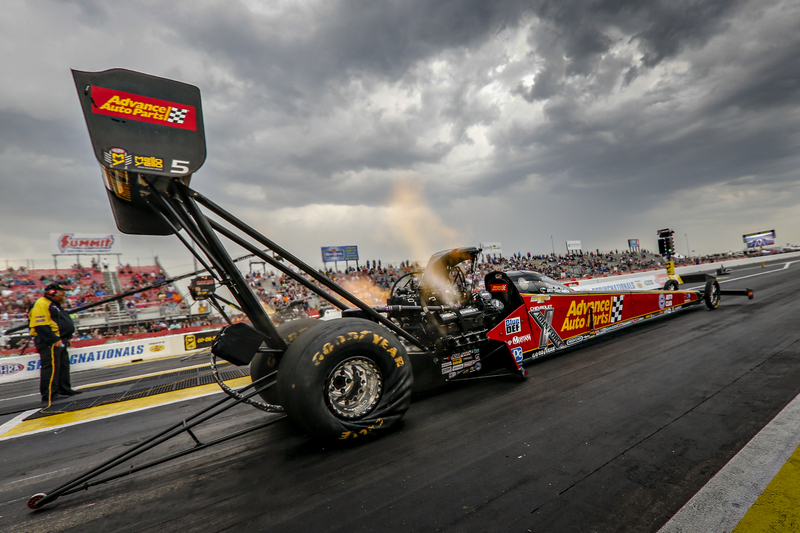 BAYTOWN, Texas — Sunday’s first-round pairings for eliminations for the 32nd annual Mopar Express Lane NHRA SpringNationals presented by Pennzoil at Houston Raceway Park powered by Pennzoil, the fifth of 24 events in the NHRA Mello Yello Drag Racing Series. Pairings based on results in qualifying, which ended Saturday. DNQs listed below pairings. Top Fuel — 1. Brittany Force, 3.661 seconds, 332.18 mph vs. 16. Cameron Ferre, 4.028, 291.89; 2. Steve Torrence, 3.703, 324.67 vs. 15. Kebin Kinsley, 3.837, 313.29; 3. Leah Pritchett, 3.709, 326.79 vs. 14. Shawn Reed, 3.796, 323.43; 4. Clay Millican, 3.718, 318.84 vs. 13. Richie Crampton, 3.780, 317.19; 5. Billy Torrence, 3.720, 325.22 vs. 12. Scott Palmer, 3.771, 321.81; 6. Mike Salinas, 3.723, 320.89 vs. 11. Antron Brown, 3.753, 326.56; 7. Austin Prock, 3.727, 325.92 vs. 10. Jordan Vandergriff, 3.733, 324.67; 8. Doug Kalitta, 3.727, 316.45 vs. 9. Terry McMillen, 3.732, 323.04. Did Not Qualify: 17. Jim Maroney, 4.054, 288.21. Funny Car — 1. John Force, Chevy Camaro, 3.888, 319.29 vs. 16. Terry Haddock, Ford Mustang, 4.182, 294.69; 2. Ron Capps, Dodge Charger, 3.893, 319.29 vs. 15. Jeff Diehl, Toyota Camry, 4.118, 293.98; 3. Tim Wilkerson, Mustang, 3.895, 321.12 vs. 14. Blake Alexander, Mustang, 4.095, 301.20; 4. J.R. Todd, Camry, 3.903, 326.08 vs. 13. Jim Campbell, Charger, 4.037, 311.92; 5. Robert Hight, Camaro, 3.908, 314.17 vs. 12. Jonnie Lindberg, Mustang, 4.005, 305.49; 6. Matt Hagan, Charger, 3.916, 318.47 vs. 11. Tommy Johnson Jr., Charger, 3.959, 312.13; 7. Cruz Pedregon, Charger, 3.929, 324.67 vs. 10. Shawn Langdon, Camry, 3.948, 315.19; 8. Jack Beckman, Charger, 3.932, 311.34 vs. 9. Bob Tasca III, Mustang, 3.940, 316.90. Did Not Qualify: 17. Todd Simpson, 5.169, 149.56.